The r88 is a stunning stereo ribbon microphone, developed by AEA that yields a natural, big open sound. The ribbons can handle high SPL and have an excellent transient response. It’s a stereo ribbon microphone that captures a very natural soundstage with an SRA of around 75 degrees. On playback the sound sources one captures via the standard Blumlein polar response pattern places or rather spreads the captured sources fairly evenly across the soundstage reproduced by the speakers. Angular distortion is negligible and musicians can use parallel foldback mixes to place themselves within the said soundstage, acting like faders and panners by positioning themselves within various distances around the microphone. Amazing on strings, overheads, guitar, vocals and much more. Designed as a general purpose utility microphone, the Bock 195 quickly became a favourite for many engineers. It was meant to be an improvement for the original and still popular Neumann U87. 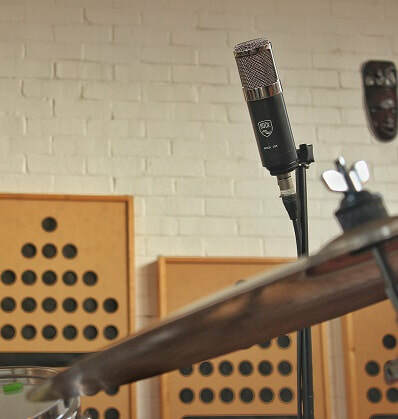 However it became more of a replacement for the vintage (and expensive) U47 FET model.’ as a bass drum mic. It is a large diaphragm cardioid-only Condenser (FET) microphone. Great on drums, and vocals alike. 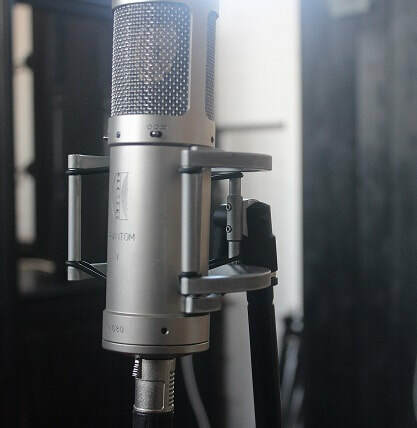 Another large diaphragm Condenser microphone, the Brauner Phantom V is Perfect for ‘big’ clean sounding vocals it has incredible sonic detail and quality, allowing us to capture the quietest and most delicate of sounds. We also have the usual stalwart of Sennheiser 421s, Shure sm57s and SM7bs, and AKG C451Bs, amongst others. We record using both tried and tested techniques as well as using specialised arrays for surround and higher order spatial mixing formats. But the microphones and an understanding of acoustics is only the first step in shaping the sound you need for your desired project. Dependent on what kind of colour and tone you need, we can mould the sound via a number of different stock and boutique pre-amps.